SteamPunk Glass: Is Groundhog day over? The workbench is more of a disaster area than usual! There's no time for tidying! After a very quiet period between the end of the Olympics and start of the Paralympics I decided it would be good to try and do a few more days. Originally I'd intended on doing Friday to Sunday, or skip Sunday and come back on Monday for the day (an extra day added during the events,) but I ended up doing five days in a row! No sooner that I was up I was on my way to Greenwich (luckily I can stay over nearby to save such long train travel) to be there between 8-8.30, grabbing breakfast along the way. The hours were trimmed back during the Paralympics, to a 7pm finish, but even then it doesn't mean finishing packing away to gone 8-8.30pm, in time to grab a bite to eat if I hadn't managed to eat at the stall, before heading off for an early night! A few hours later and the alarm was off again; what day is it? Sunday, Friday? It started blurring by the time it got to Tuesday, the last day of the Paralympics in Greenwich. 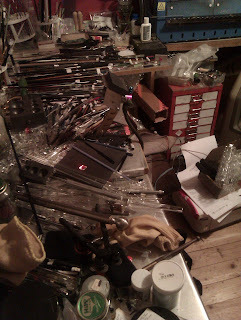 I have been really surprised on how inconsistent the days have been, it's been really hard to plan for, days I expect it to be quiet have been busy, and vice versa, days when there have been lots of people I've hardly sold anything; it's been impossible to know what days to turn up and which ones to stay in the workshop! A lot of new stuff has had to be put on hold that I'd really like to work on. The only thing I am sure of is that my feet still ache 24hrs later! 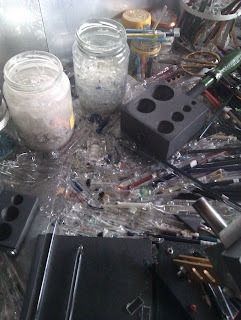 I really must sort out the debris, and empty those dump jars of grot glass! Now that's over it's time to start again! It's only a few weeks to the end of October and the next big MCM Expo, I have lots of ideas for new alien specimens, a backlog of marbles I've been asked for, plus it's now barely two days before I need to be back for the next weekend in Greenwich. I'm also hoping to sneak an odd day off too, maybe a Sunday, which I am sure my feet will be very grateful for! This is a Flickr badge showing items in a set called m. Make your own badge here.